Because people will buy them. They are smooth, quiet, powerful, efficient, clean, convenient, and fun to drive. There is also air quality. Compared to the cleanest gasoline cars, such as hybrids and PZEVS, electric cars reduce emissions of hydrocarbons, carbon monoxide, and nitric oxide, even considering the emissions from powerplants. Perhaps the best reason is energy security. Everyone from the President on down agrees we import too much oil and that it comes increasingly from unstable regions of the world. We have to shift our energy use away from oil. Electricity comes from natural gas, coal, hydro, solar, wind, geothermal, and nuclear, but very little electricity comes from oil. Electricity is energy without oil. Electric vehicles are transportation without oil. Some think hydrogen is the ultimate fuel, but hydrogen is made using electricity. It is more efficient, economical, and convenient to use the electricity directly to charge electric cars"
OK, maybe a bit overblown, but the main point is true...we can make electricity without oil, and that's why electric is the wave of the future. "Masuko said the envisaged electric car will have a lithium-ion battery, emitting no gas and requiring only one-fifth the energy to drive compared with hybrid gasoline-electric cars. The electric car will be modeled on the mini-vehicle called i, also a brand-new model, and have an 'in-wheel motor' system in which a motor is directly attached to the wheels, according to a company official. The car will make its first test run next year, the official said." Fantastic! Mitsubishi is making a great, bold move, good for them (and us). "Rumsfeld and Bono — only on this Sunday's 'Meet the Press with Tim Russert.'" ...with off the shelf parts, then the future of electric vehicles (watts cars?) is bright indeed. Topsail High is KICKNGAS! Why aren't we talking about this? As Scahill points out, this was a month before the Congressional vote, and two before the UN resolution. Supposedly part of enforcing 'no fly zones,' the bombings were actually systematic assaults on Iraq's capacity to defend itself. The US had never declared war. Bush had no authorization, not even a fig leaf. He was simply attacking another nation because he'd decided to do so. This preemptive war preempted our own Congress, as well as international law." "It's been a long campaign of persistent persuasion by British Prime Minister Tony Blair and Irish rock star Bono. But finally, on Saturday, they won a victory for the world's poorest continent. President Bush could hardly say no to the deal. Many of the 18 nations can't pay their debts anyway. Also, because of a new US strategy to try to keep impoverished nations from becoming terrorist havens, Africa is prime turf. Most of all, Bush couldn't resist the pleas of Mr. Blair, who chairs the G-8 this year, because the US recently won about $33 billion in debt relief for Iraq from 19 nations." "A very reputable, very careful group of scientists at the University of Los Angeles (Brian Naranjo, Jim Gimzewski, Seth Putterman) has initiated a fusion reaction using a laboratory device that's not much bigger than a breadbox, and works at roughly room temperature. This time, it looks like the real thing." "The smallest transistors in consumer electronics devices today measure 50 nanometers across -- a million times tinier than their postwar progenitors. (This shrinkage would be equivalent to reducing the continental United States to the size of a hot tub.) Taking transistors down another one or two orders of magnitude, to the realm of individual atoms and molecules, requires a generational leap in technology." and that leap will take a solution to the Third Finger Problem. Hydrogen itself may be non-polluting, but there is a sting in the tail. It is produced either as a by-product of the coal, oil or gas industries, or by splitting water molecules using copious amounts of electricity, often generated by nuclear power plants. No current production technique is non-polluting. Researchers are pinning their hopes on solar-based production, a method Michelin is working on now. Specialists say that eliminating pollution from the production process will also boost hydrogen’s chances of mainstream success. “If you can introduce a method for producing hydrogen cheaply and cleanly, this would probably the best argument for its use,” Wokaun told swissinfo." Well then, that would be a good argument if we could produce hydrogen cheaply and cleanly, but we can't. So why are we persuing hydrogen? Electricity can drive autos....batteries aren't as dangerous as hydrogen. Seems to me that just a few improvements in battery technology and we could have great electric autos that could charge themselves (like hybrids) during braking, take an 80% charge in 10 minutes and have a range of 200 miles. Sure, electricity isn't clean, but it could be with improvements to the electrical grid and forward thinking about nuclear power, fusion, etc. Why waste time on hydrogen? My guess...it's another behind-the-curtain giveaway to big oil. What will they do when the oil runs dry...well, they'll be in the hydrogen business! Even oil companies gotta plan for the future, a future without oil. Stopping air pollution is a noble goal, but hydrogen does not address that. Sure, water vapor will come from the hydrogen-powered auto, but the plant that makes they hydrogen will be burning fossil fuels, or be powered by electricity. So why not just power the autos with electricity? Oh yeah, the article I linked to is pro-hydrogen, and the part I quoted is at the very end of the article. "In fact, the people inside the towers were better informed and far more knowledgeable than emergency operators far from the scene. While walking down the stairs, they answered their cell phones and glanced at their BlackBerries, learning from friends that there had been a terrorist attack and that the Pentagon had also been hit. News of what was happening passed by word of mouth, and fellow workers pressed hesitating colleagues to continue their exit. We know that US borders are porous, that major targets are largely undefended, and that the multicolor threat alert scheme known affectionately as 'the rainbow of doom' is a national joke. Anybody who has been paying attention probably suspects that if we rely on orders from above to protect us, we'll be in terrible shape. But in a networked era, we have increasing opportunities to help ourselves. This is the real source of homeland security: not authoritarian schemes of surveillance and punishment, but multichannel networks of advice, information, and mutual aid." 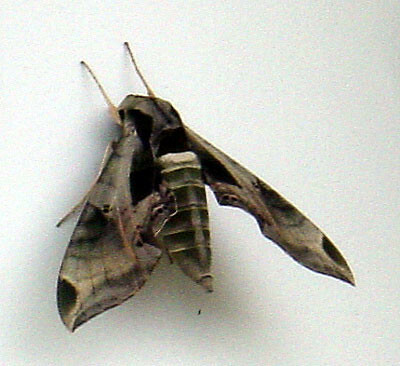 In New York, just got a place in New York"
Find the Moth, originally uploaded by watts4u2. moth, originally uploaded by watts4u2. "Opportunity's wheels started slipping April 26 during a planned 295-foot trip. While trying to drive over a foot-high sand dune, the robotic explorer stopped moving, its wheels hub-deep in soft soil. Engineers spent weeks with an Opportunity mock-up figuring out what commands to give the robot to free it, but the maneuvers took time. The rover inched forward less than a foot in a month, losing most of its traction every time it tried to roll. 'It's kind of like we were swimming through it,' Erickson said. But on Saturday morning, data showed that Opportunity was free at last and had moved several feet across the dune." "In 1967, Liberty was the most sophisticated intelligence-gathering or spy ship in the U.S. fleet. On June 8, during the Six Day War involving Israel and its neighbors, Liberty was in international waters of the Mediterranean Sea off the coast of the Sinai Peninsula when it was attacked without warning by Israeli aircraft and torpedo boats. The attacks on the lightly armed vessel began with aircraft cannon, rocket and machine gun fire, and napalm. Following the air strikes, Liberty took a torpedo amidship. When crewmen lowered life rafts to rescue personnel and in preparation for abandoning ship if necessary, the torpedo boats machine-gunned the life rafts and crewmen. All told, the attacks lasted a little over two hours. During that time, Liberty 's calls for help reached the U.S. Sixth Fleet, despite Israeli jamming efforts, and the carriers Saratoga and America launched aircraft to assist the beleaguered vessel. But that help never arrived. The aircraft were recalled on direct orders from the White House." "Climate scientists trace warming temperatures largely to greenhouse gases added to the atmosphere from burning fossil fuels such as coal, oil, or natural gas. The nuclear industry has long argued that nuclear energy must remain an option to reduce those emissions. But it's been a tough sell. Accidents at Three Mile Island in Pennsylvania in 1979 and Chernobyl in the Ukraine in 1986 still echo in public discussions. These memories are kept fresh by many environmental groups who see nuclear energy as too dangerous and too expensive. They push instead for greater energy efficiency and increased reliance on renewable energy sources. Yet faced with global warming, some groups, such as the Pew Center on Global Climate Change and Environmental Defense, appear willing to give nuclear energy a reluctant second look. Support for new reactors also appears in a bill introduced last Thursday in Congress. Sens. Joseph Lieberman (D) of Connecticut and John McCain (R) of Arizona offered the Climate Stewardship and Innovation Act of 2005. It would require the Environmental Protection Agency to set limits on emissions of greenhouse gases and set targets for achieving them. The duo has introduced similar bills in the past. But the latest measure outlines a mechanism to fund the development of new technologies to help achieve those targets. Among those technologies: three unspecified new nuclear-reactor designs." We need to do this. No, it's not perfect, but Nuclear is the best way to quench our unrelenting energy thirst at this time. Couple it with cleaner coal burning applications, biomass ethanol, and advancing battery technology and we can begin to prepare ourselves for the end of cheap oil. Yeah, solar and wind power would be great, too, but in real life, these technologies have not been able to produce enough power for their size & cost. I've long wondered if it would be possible to harness the power of lightning (each strike can power a city for so many days....). If we could store that energy in some new kind of battery....an instant charge that could power an entire grid....OK, I'm dreaming, but this is why I think battery power is the future. There is plenty of energy out there to harness, it's the "holding" of the energy that is difficult. "The 10-year battle to wipe out the debt burden of the world's most impoverished nations is reaching a climax. Hopes are running high that when leaders of the richest countries gather next month in Scotland, they will insist that two key players - The World Bank and the International Monetary Fund (IMF) - forgive billions of dollars of debt. The logic behind debt relief is twofold: 1) Countries no longer indebted would have more money for education, health programs, sanitation, and services for the poor. 2) Many of these loans are so-called 'odious' debts, made by onetime dictators instead of elected representatives. Since the United States has already persuaded other countries to forgive loans made to Iraq under Saddam Hussein, the logic goes, then debts made under other former dictatorships, from Nigeria to the Philippines, deserve similar treatment. The US stance on Iraqi loans, plus repeated high-profile protests at international meetings of wealthy nations, have moved debt relief from the bottom of the international agenda to near the top. In addition, thousands of people are expected to protest in Scotland July 2 to help keep President Bush, British Prime Minister Tony Blair, and the other leaders of the G-8 (the G-7 industrial nations plus Russia) on track to forgive billions of dollars of debt, primarily for poor sub-Saharan nations, when they meet four days later in Gleneagles, Scotland. 'Expectations have been raised very high,' says Mark Engler, an analyst with Foreign Policy in Focus, a New York think tank." What's this....something good has come from the Iraq invasion? Alert George W., he should be draping himself in this, but alas, my guess is more promises with little to back it up. icWales - Welsh car team pioneer electric dream: "Imagine an electric car that produces hardly any noise, no air pollution, and is as fast as a Ferrari. It might become a reality in the near future, thanks to a revolutionary new motor designed by an enterprising team in Wales. If the IMP motor meets expectations, it could usher in a new age of rapid, clean, electric transport. As well as high performance vehicles, there are plans for a battery-powered family car with a range of hundreds of miles." "Where you stand on 'peak oil,' as parties to the debate call it, depends on which forces you consider dominant in controlling the oil markets. People who consider economic forces most important believe that prices are high right now mostly because of increased demand from China and other rapidly growing economies. But eventually, high prices should encourage consumers to use less and producers to pump more. But Deffeyes and many other geologists counter that when it comes to oil, Mother Nature trumps Adam Smith. The way they see it, Saudi Arabia, Russia, Norway and other major producers are already pumping as fast as they can. The only way to increase production capacity is to discover more oil. Yet with a few exceptions, there just isn't much left out there to be discovered. 'The economists all think that if you show up at the cashier's cage with enough currency, God will put more oil in ground,' Deffeyes said. There will be warning signs before global oil production peaks, the bearers of bad news contend. Prices will rise dramatically and become increasingly volatile. With little or no excess production capacity, minor supply disruptions -- political instability in Venezuela, hurricanes in the Gulf of Mexico or labor unrest in Nigeria, for example -- will send the oil markets into a tizzy. So will periodic admissions by oil companies and petroleum-rich nations that they have been overestimating their reserves." If peak oil isn't here yet, it's close enough that some of these signs are already happening. I can't help but think that our need for a reliable oil supply was the underlying reason for the invasion of Iraq. It seems like Iraq is a dry well at this point...we need an exit strategy that insures us a source of oil for the tough times ahead. Secure the oil fields for ourselves? We could build our bases in the most oil-rich places in Iraq. I don't know what to do at this juncture, but we need to get something from the investment we've made in this war. Callie Sans Hat with Jack, originally uploaded by watts4u2. Callie with Hat, originally uploaded by watts4u2. 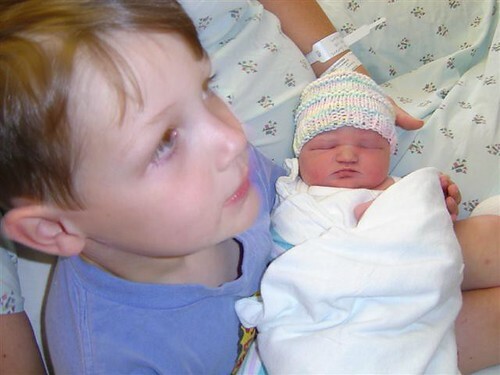 Callie with Big Brother Jack, originally uploaded by watts4u2. She's here! Congrats to Libba & Pook & Jack on their new addition. I'm an Aunt! Wait...a niece? Never had one of those before...welcome to the world little one!